He didn’t mean to upset his Spell. He just wanted a piece of pie. No, he thought, not just a piece of pie. This was a magnificent pie, a pie that bards would not dare to sing of. How could their mere voices compare to the taste, the smell, the sensation of that concoction gliding down the throat in jubilation? There would be no songs of this pie, they would not be enough. No, instead, there would be pie. The Spell. Think of your poor Spell. He brushed the thoughts from his mind. He really, really wanted pie. It was a new Charm. A conjuring that he had found in a gastro-alchemical cookbook. Chance encounter, something he hadn’t even considered. It was not his, but after he had read the words he didn’t care, he was going to make it his. Just the text, just mere words on the page made his mouth salivate. This pie was flamed with magma conjured down from the finest heavens, brought to bear that he could experience such sweet succulence. And the delectable ingredients, he could barely consider the tastes laid before him. Apples, he thought, apples and red currant. The apples were brought forth from his own imagination, the currants not. No one truly remembered or imagined a best way for currants to be, chance it had to be plucked out of the ether of currant ideal. Spiced with a dash of alchemy, the fruits melding to cinnamon and liquid life. What did liquid life taste like? He asked this of himself, but the Charm just assured him it would be delicious. She was calm, reassuring, he thought. She understood. That was it. He had to have this pie. He gripped his wand carefully, and spoke the words. Spoke them trippingly, with just the right lilt to barely contain his excitement. The wind tore his clothes open. He was revealed, exposed, and the Charm fled him. Back into the book where she belonged, and it slammed shut and locked the cover. It understood the bonds, broken and violated. It understood fear. His Spell had arrived. In fury she rose out of nothing to appear before him. Cheater, she whispered. He was soon being force fed these words by the Spell. A quaint thing, a memory really, not more than that. It was a cake recipe for an old flame of his, he wasn’t seeing other spells. The pie had nothing to do with how he felt about the cake. Her cake. Cake was amazing, it had its place, and cheesecake truly was a marvel in dairy confection, she protested. Both he and the Spell knew he was lying. How could he go back to bone-dry powder when this succulent Charm lay on the tongue? One simply was better, and she just couldn’t measure up to this new Charm’s pie. He spoke the words of his Spell again, pleading with it. The diction flowed from his tongue, and he felt ashamed. There was a better way to approach breaking up with a piece of magic. The Spell, for its part, tried its best not to tear him apart across ethereal winds. It wasn’t usually so close to being alive, but magic was a tricky thing. It chose when it would be alive, or was it that it was chosen to be alive? Magic is a confection that does not know its own recipe. But the Spell did know it was angry. How could he? Had this Spell not given him everything he had ever asked for? There had never been a cake that was not provided. Even those rum-soaked things that left him crawling on the floor for the next two days. The Spell was betrayed. No, that was not true. There had been fault both ways. That last carrot cake had had a rabbit attached, armed with buck teeth and buckshot. And the pound cake had almost flattened him, the poor thing. It was time for a break. The Spell and her caster looked at each other with lost longing. He had always liked the way the Spell had tasted on the tongue, when it sailed through the winds. And he wasn’t so bad, just needed to floss before he tried the hard consonants. The sorrow was true and shared. Still, he cheated on the Spell. If she just let this stand, where would she be? What would I be? So the mage was bound in a pie tin for one hundred years. Maybe less if the spell was feeling generous. He was cute, and often nice. Maybe sooner, if he wanted a piece of cake. Harsk took another drink. The tavern was home to him and his Riders, as much as anywhere was. There were barely enough lamps to bathe the taproom in a pale glow. The chairs were scattered around, two or three leaning against a wall to hide a missing leg. He breathed deep. There was a lot to be said about the truth of a scent. Sights could be blocked, sounds muted, tastes overwhelmed, but the scent will always remain. Like the cigar smoke that hung in the chairs, the ash long sunk into the seats. Or the beer stains of a lager the bartender broke out for a new birthday, or one of the serving girls having a baby. There was blood from a bar fight, and there was old rain soaked into the roof, the scent of iron mixing with musty wood. It spoke of a place that had grown settled into the dirt, and happy being humble. Harsk scrunched his eyes shut, enjoying the burn of whiskey as it hit his gullet. He knew behind him were two of his Riders, three tables away. Far enough away that Harsk could be considered alone, but ready to jump in if anyone with a grudge walked in. They were good boys, both of them. Harsk couldn’t remember their names. They hadn’t been there long enough to worry about the simple things, like pain, worry, death. Wait, wait, no…there was a name coming up. Parson? Carson. Carson, the laugher. Killed a vampire goat before he joined up. Couldn’t stop laughing about a bleating bloodsucker. Harsk coughed, hoping it would hide his own little laugh. The other one…no, nothing. No name was coming up. He was new, and alone. Carson sat next to him, but no interaction. The Rider had joined up just a few months ago. Something about a ghoul. Solid, though. Nobody walked in looking for trouble. This was a recruiting day. Rael had been killed in an exorcism last month, and the mourning was over. The bones had been destroyed, salt had been mixed into his ashes and spread out over his favorite river. Rael had been a good boy, just kept his sword on his back to stop it from slapping against his manhood. He wouldn’t be using either again. The Riders were used to death. Three Riders had died this past year, it was part of the job. And there was a bigger take of the bounties when a brother died. More to send home, or spend on a night of carousing. A few drinks spread here and there, and the Riders were forgiven for murder. They were good boys. The Riders looked up, and moved to one side, Carson grabbing a drink at the bar as one of the patrons moved away. It was a decent enough crowd, quiet. At dusk the crowd was not raucous, looking for some excitement in a fight or a song. But neither were they so far into their mugs that melancholy choked away all semblance of decency. It was a small crowd, just a group of people sharing the same space for a time. A boy walked up to Harsk. The boy was tall, and strong. His shirt rippled with muscles underneath, though Harsk knew the boy had been building his courage up for the past hour. He moved to the left, to the right, reset again, and smiled when he bumped into the table. “Captain Harsk,” The boy began. They always got boys. Harsk took another drink. Harsk’s Hell Ride was a legend unto itself. 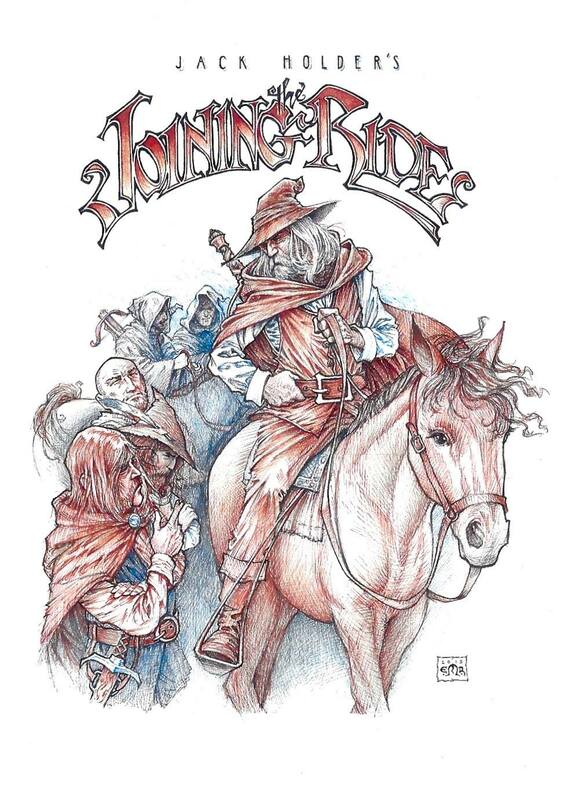 He took any job, and his Riders had followed him into realms that only existed in a child’s twisted dream. Always without question, always for a better cause. People idolized the Ride, worshipped them. Harsk hated it. People idolized the idea of fighting demons. Of fighting beings that crawled out of an infernal pit, the stink of the Deep still clinging to their flesh. To boys, fighting beings that could rip puny humans to the bone was fun. The chance to feel those claws wreathed in fire, the risk of adventure, the thrill of it all. “Captain Harsk,” The boy tried again. “Stop.” Harsk said. He stared at the young man, trying to make sense of him. There was dirt on his jeans, good soil from a field tilled for generations. The hands were calloused, but to hold a hoe, not a sword. There were burns on the left hand, a hearth-fire perhaps. The closest thing to a weapon those hands had held was the axe when wood needed chopping, or a torch to keep the wolves at bay. A farmer. A recruiting day brought him a farmer-to-be. Some idiot boy who had what he considered a puny future, a paltry destiny. Nothing compared to the glory and riches of Harsk’s Hell Ride. Who cares about the cost? Who could compare a wife, a child, a home, to the thousands that had screamed Harsk’s name as he rode into one town after another? What is a legacy of a solid line, compared to a legend? A legend of blood, the blood you spilled defending a home. A legend of fear, wiping a cursed farmstead off the face of the planet rather than it infect the countryside. “Where do I sign up?” The boy slammed his hand on the table, that big grin back on his face. Harsk took another drink. There were the burns on his hands. Calloused burns, for hands used to the burn of black iron. It followed a good smell, smell of grain and a warm fire. Must have just finished his chores and ran into town when he heard about the opportunity. Headtown. Bandits raiding a small mining town before striking up north. Three, no, four seasons ago. That was when Jorry died in my arms and Klaer lost his pinky. Klaer always joked about how many demons he had ‘thrown down,’ to lose something to a simple bandit was just embarrassing. The dwarves weren’t harmed, but they weren’t pleased when Harsk toppled a refinery in his charge. But a troll wasn’t going to be stopped by a mere crossbow. Young learned this when he was bashed to death with Denton’s body. It was a small comfort that only two died against a troll. Harsk stood up, and the boy fell silent. The smell of smoke had filled Harsk’s nose, a noxious fume of burning flesh as Klaer stumbled out of a cave hidden away in the hills far above civilization. He had been writing a girl, a world away from this nonsense. He was going to leave. And so he did. As soon as he said it, Harsk regretted that last word. The boy’s eyes flashed, and the old man could see the resentment sit on the boy. There was nothing wrong with wanting a better life. And if one can’t have riches, glory is a glad second choice. He’ll stoop soon, hunched from a terrible lot in life. A back broken by bad circumstance and toil. His wife won’t be the prettiest, and he’ll have more girls than boys. A certain lot in life, a defined lot. Better to hunch in a field then to have garlands over an early grave. “But there’s no glory in the dirt, is there?” Harsk murmured. Harsk turned to the Riders, shaking his head. Perhaps the next town over would have some recruits that weren’t searching for glory. The Riders turned to look at the boy. But he had turned as well, fists raised in the direction of the voice. Harsk smelled turnips. The girl standing before them was covered in turnip shavings. He could see three sticking out of a torn apron, and a travel sack had a turnip sitting beneath it on the floor, waiting for its owner to notice the vegetable had taken a short flight. The girl did not look like a turnip. She looked pretty, and average for the girls around the area. Dimples that had not been used often enough, her eyes were waiting to brim with tears. She seemed to want to cry, but not sure about what. Harsk winced as the girl’s foot lashed out, catching the boy right between his legs. The whole tavern seemed to cross their legs as he crumbled to the floor. A soft whimper resounded between Harsk and the turnip girl. Harsk gave a quick nod to the Riders, and sat down as they dragged the boy away. The girl rushed into the empty chair, and stared back at the man. His back was a board. His fingers twitched, the sword at his side begged to be called. He took a quick sniff, but there was no brimstone. No sulfur. Just turnips. One of those questions. Harsk sat down again. He most likely wasn’t going to be able to get another glass for a while. Harsk looked at her crestfallen face with little pity. He did not want to hear another bad romance. Demons reached this realm to destroy and corrupt. They were not tortured souls, they were not pretty, and they did not fall in love. They killed, they tortured, and any love they wreaked was nowhere nearing consensual. This girl had to realize that. She may be meek, but that kicking foot was attached to a quick mind. Either that, or had too much experience being touched. Harsk’s eyes opened, and he looked at the girl. Really examined her. He saw the matted brown hair, the eyes that caught every sudden movement. The mouth was open a hair, ready to scream if help could come. The legs that were spread just a little too wide, feet planted and ready to run. Harsk’s hand reached for his sword, patting it underneath the table. The girl twitched, her feet slamming against the floor. The bar turned again, and Harsk raised his hands. “Easy girl, I was just going to buy a drink.” He raised a hand, and Carson walked over to the bar. Harsk waited for more of an explanation. It wasn’t coming. He rolled his shoulders, the girl jumped. He held up his hand, taking the offered drink from his man. He took a long drink, keeping an eye on the girl. She let herself relax. The girl trailed her hand on the table. Harsk noticed his unknown Rider watching, not even hiding his gaze now. The young man’s eyes were locked at the girl’s back. He wasn’t alone. Harsk looked at the glass. It was the whiskey, and he wished it were an ocean now. Maybe an ocean of whiskey could drown out the question. He downed it, and hoped it would be enough. She ran. The Riders gawked for a moment, still unsure of the cause, but Harsk was already after her. She burst out the door, a hand snaking after her. Harsk grabbed a hold of the girl, scattering turnips. A sound of thunder and earthquake shook Harsk to his bones. He looked up to see a monstrosity rear and face him. It was short, coming up to his height at full stature, with yellow hair that clung to a stocky frame. Steam raised out of its nostrils, and the scream shook the windows. Harsk could not believe what he was seeing. A goblin-bred horse. The goblins bred horses with the caves and the temperament in mind. A goblin fought both above ground and beneath it, and a horse it had to leave behind was better as food. But a goblin-bred horse was fast, was mean, and might eat the goblin instead. A goblin-bred horse was a prize amongst broken perversions. The girl slipped out of his grip, running to the horse. Harsk could feel the tavern empty behind him. It had not been a busy night, but it was busy enough. He could feel the gaze of many eyes on him, sense their questions. Who was this girl, what was her crime? Better yet, what was her punishment? He wasn’t sure if he had the answers. The girl laid a hand on the horse’s shoulder. The Riders looked to their hero. Knives were out, for lack of a better option. Carson would hold the girl back. He wouldn’t kill her, couldn’t, not yet. They would both mourn the horse as they slaughtered her. It was a rare breed, a true wonder. Harsk walked up to the horse, and glared at Clari-Anne. The horse glared back. He took a deep breath in. He smelled a little rust, one of the Riders forgot to get the dagger cleaned last night, Carson. Sweaty horses, sweaty men. Clari-Anne had a matting of deep mud, underneath the road dirt and a sour smell for herself. An undertone of sawdust, common enough outside a tavern surrounded by a mob of folk that did their own carpentry. Solid folks, with beliefs that won’t change. Burnt turnips. What did that even smell like? He kneeled in front of the girl, laced his fingers, and held them out to the girl. She stood, and jumped onto Clari-Anne. The Riders moved to the sides of the horse. It breathed heavily, and they moved a step away. Harsk wondered if he would be so welcome the next time they rode into the tavern. The night wind chilled him more than such thoughts. The old man was content. He no longer smelled burning flesh, or burnt bread. He wondered how swaddling clothes would smell with a touch of brimstone. He pushed the thought away with a shudder. He’d get used to it.